I personally use Irwin Marples blades with great success, which you can usually find at Lowes. I feel they are the sweet spot as far as cost vs performance for me. If you have the money and want the absolute best quality then go with Forrest. I run a 90 tooth blade for fine cutting. But for dead nuts miter cuts I use a 45* sled on the TS. I’ve switched to Everlast blades on my miter saw. I was using Freud Diablo blades and they are really good, but the Everlast are better. Much better tooth geometry for specific tasks with better quality and thicker carbide. I’d put them up with Forrest for quality and usually at a little better price. Everlast was selling to mostly commercial, but is expanding out to retail. There are a lot of saw sharpening shops that sell them, but they can now be purchased on Amazon, as well. I ve switched to Everlast blades on my miter saw. I was using Freud Diablo blades and they are really good, but the Everlast are better. Much better tooth geometry for specific tasks with better quality and thicker carbide. I d put them up with Forrest for quality and usually at a little better price. I was going to mention the Freud blade, as they are relatively inexpensive at Home Depot. And a miter saw is difficult to get accurate 45s for picture frames anyways, especially on sliding saws. Good luck with that Hitachi saw. I have had a Hitachi 12” compound miter saw for about 2 years and I am very disappointed with it. I do recommend you use a high quality blade to make up for the inadequacies of any new Chinese saw. I recommend high end Freud Diablo, AMT, or Forrest. Your choice on tooth count. As noted previously, you can’t go wrong with a Forrest 12” ChopMaster. I get smooth cuts on my Bosch SCMS using one. Watching the feed/speed rate helps ensure a tearout free cut. Like someone said, nothing wrong with the Irwin Marples blade or any other mid priced big box store blade. 80 tooth. Good for years. 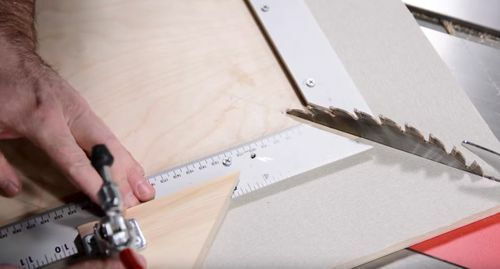 If you think about it a miter saw actually cuts very few board feet, just a lot of small chops which usually aren’t the finishing cut anyway and isn’t used for ripping. JMHO. 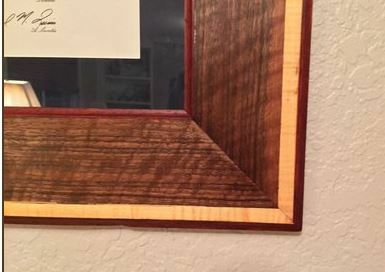 However, re-reading your post, a 12” miter saw is not the way to get accurate 45 degree picture frame cuts. A miter saw has too many moving, bending, sliding spinning parts for that kind of accuracy. It’s just not made for that. Miter saws were originally designed for the construction industry. It is deadly accurate. The thing I like about it the most is that the measurements are based on the length of the glass/mat regardless of the width of the frame rails. So if the glass and matte are 37 3/16×24 7/8 that’s what you measure and cut. Don’t bother with the fancy micro-jig sliders he uses. It’s what I use to make frames like this one. Keep the saw but make the jig. Hmph…didn’t know Forrest did a miter saw blade. “add to cart” here I come! I have the Infinity Tool 12” miter saw blade on mine and really love it. Can’t go wrong with some of the other recommended ones here. On the miter saw I use a very nice blade, but usually save the money for the TS blade for the sled. The crosscuts can be ok, or even a little rough. Right now I have this Freud on my 12 inch chopper I picked that one because I had a job where I was cutting 8” wide pieces of plywood to length, and I didn’t want it to fray up at the cut lines. It does a great job on solid woods as well, so if you will it’s a “combo” blade for all materials on a chopper. If it wasn’t for the plywood I had planned I would have bought a lower priced blade for the chopper. I’ve found when sharp even medium quality blades work ok for non finish cuts on a chopper. Andy I agree, that jig the Drunken Woodworker made is awesome. So many just make a point for 45*, then you are lost trying to accurately cut your pieces to the correct, or even a repeatable length. If the subject was just picture frames I would suggest that over any other jig I have seen, ho made, or purchased. It’s the slick Willy of woodworking jigs. But it’s only as good as you make it. Because of the larger diameter of a 12” blade, I’d stick with a full kerf blade to reduce deflection. 80-100 teeth in an ATB or ATB/R combination should be fine. If you plan to cut a lot of very hard or abrasive materials, look to a triple chip grind (TCG). There are some really good choices from Infinity, Ridge Carbide, Amana Tools, Forrest, Tenryu, Freud Industrial, Everlast, CMT Industrial, etc.